We are pretty chuffed that Eatsplorer have put together a stunning piece about our newly renovated vineyard cottages. The Bartinney team collaborated to share our little slice of tranquil heaven with wineland visitors. The guesthouses set amongst the dynamic mountain vines on the working estate, enjoy unrivalled views and contemporary farmland luxury. We are just to spot for Cape explorers and foodies, with our innovative ‘Wine & Fynbos’ experience at the estate Tasting Shed, and wonderful neighbouring restaurants. On request, Bartinney will fill your fridge with delectable locally sourced deli goodies and wine. Perfect for a group of friends or a small family, this beautiful cottage with its English and Cape Dutch features comes with two en-suite bedrooms (one kingsize and one twin), two full bathrooms with luxurious deep baths and walk-in showers, a fully equipped kitchen with fridge and freezer, and a spacious open-plan living area with a private terrace and braai. There is a main cottage entrance, as well as private doors to each of the two bedrooms. Situated on a gated wine estate with 24-hour security and safe parking, the cottage is fully serviced daily for your convenience. Please note: there are a few steps to walk up from the parking to the house. More, information & bookings. Or check out our Airbnb. Airy and light, this recently renovated cottage features a stunning double-aspect ceiling reinforced by beams crafted from wood sourced on the farm, and is decorated with pops of bright, bold colour, gorgeously patterned tiles and special personal touches like old family portraits and an antique desk that’s been converted into a kitchen island. Both bedrooms are fitted wtih with soft, luxurious sheets, the bathroom has a deep bath and walk-in shower, and the kitchen is fully equipped. Summer will be best spent in the private terraced garden with its own braai place, while the indoor fireplace should keep you nice and cosy in winter. 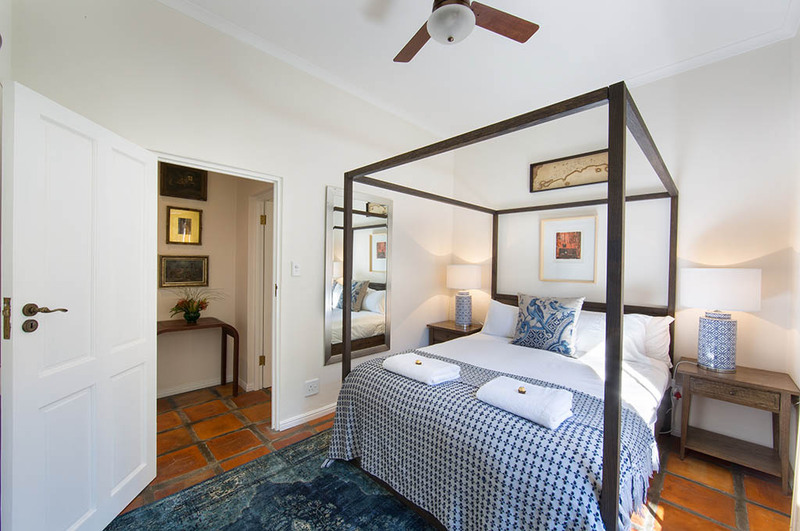 Situated on a gated wine estate with 24-hour security and safe parking, the cottage is fully serviced daily for your convenience. A real oasis of calm, this spacious stand-alone house is set right amongst the vines. With two double rooms and one king-sized room, two full bathrooms with deep baths and walk-in showers, a fully equipped open-plan kitchen and dining area, spacious verandah and private garden, it’s the perfect retreat for a group of friends or family. Another bed can even be arranged so that the house sleeps 6! The cottage is situated on a private and secure gated wine estate with 24-hour security and safe parking. It’s fully serviced daily for your convenience. Please note: there are a few steps to walk down from the parking to the house. 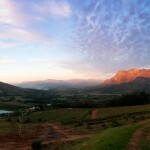 Central Stellenbosch is 15 minutes away from the estate, while Franschhoek is 30 minutes away.